SalsaCrazy Mondays features beginner & intermediate salsa dancing lessons followed by Dancing at the Neck of the Woods (formerly the Rockit Room) every Monday night in San Francisco. Beginner friendly atmosphere, no partner necessary. Free street parking available nearby. I have a blast here all the time. There are always alot of people and the crowd is cool and laid back. The atmosphere is non-pretentious and you can tell that the people that dance here are there to have fun. It doesn’t feel like you’re “competing” either, though there are some members of dance teams that go there to social dance. If you go often enough, there are many regulars and you’ll soon feel like home. Everybody is friendly and you will rarely get a ‘no’ if you ask someone to dance. You’ll also get different types of dancers.. on1, on2, and cuban style. I used to come here every Monday last year. I’m back in town and was excited to go back but its dead and there good dancers don’t go there anymore! Now, that’s a fun way to spend your Monday night. The dance level is not the best in the bay, but you can definitely find great dancers on 1 and on 2 and have a great time. They have 2 levels and plenty of sitting space to take a break or leave your shoes at. I am a girl and never had to pay at the door. This review is of the open dancing following the lessons only. This venue used to be a lot of fun with good mix of music (salsa dura, salsa romántica, and some timba) and a nice relaxed vibe. However, on a recent visit, the only music that was played for over 1.5 hours was timba, and I left without dancing to a single song. While some dancers may enjoy timba, personally I find it unpleasant to listen to and even more unpleasant to dance to. So, this is a great place to go if you enjoy timba music, but otherwise it is best to go elsewhere until the musical selection is changed. We’re so sorry you didn’t enjoy the dancing after the lessons. This was obviously a one night experience, and we’re sorry the music on that night was too much Timba. We strive to play all styles and all varieties of Salsa. While it’s impossible to please everyone, our DJs (on one or two floors) are always open to request, and very eager for feedback, and to keep people dancing all night. Please ask the DJ if you’d like to hear any specific songs, or even genres of salsa. We are always open to feedback and personal requests. LJ… has no idea what timba is. Lol. As a professional dancer I feel proud. But credit goes to SalsaCrazy. All of them were super professional. The entire environment was so friendly. The dancing room was neat and clean. I just love it. Salsa dancing nightclub is the great night club ever. I highly recommended them! This is such a cool place! I never thought I would ever get my husband to dance, but I guess this is right up his alley. The salsa class was great. There were so many different people there from all ages and backgrounds. We were not the only first timers and that made it so much better. We stayed after the class to show off our new moves at the club! This is a really awesome club, clean and spacious, and we will be coming back! Sometimes both 1st and 2nd floor is open, but usually only 2nd floor is open. That floor is concave – like a plate. The music is off – a little too much Timba-like songs. I live a couple of blocks away and usually don’t go because of the music. I am an advanced dancer and like dancing with partners of all levels, but when the music is so off – I can’t get into it. With the demise of Cocomo and so many of our beloved dance spots, it is refreshing that Salsa Mondays at Neck of the Woods is still thriving. I mostly go here because it’s not pretentious, it’s full of great dancers who are friendly and dance with beginners too. This is how salsa is supposed to be. Nice atmospheric place with decent sized dance floors and stages on both stories. Has a nice lounge area upstairs and a bar downstairs. Lesson was fairly well attended but the place was not that populated yet around 9:45pm. Attendees were of mixed ages with more in the 25-35 yr range. Only street parking available. I love this club if I could only go out 1 night a week, it would be Monday, Neck of The Woods! Super fun atmosphere with great music. What more can you ask for? Thanks Evan! What an exciting, crazy fun thing to do on a Monday night! The salsa class was huge fun and we had the best time! I went with some friends, but there really is no need to bring a partner because we meet so many cool people who love to dance. I couldn’t believe the size of the crowd! This is really becoming the thing to do and I am glad I found it before I am left behind. We stayed for the party after the class and danced all night. It did get a little intimidating with such good dancers there but that is my thing to get over. Everyone is so super nice and willing to dance with you and help you get it. The atmosphere is non-pretentious and it’s easy to see that people are there to have a good time. There’s definitely no need to bring a partner. The class is huge! A ‘small class’ has around 60 people. There is such a huge mix of people of all ages and backgrounds. While everyone else is bummed it’s Monday, it’s the best night of my week. If you come often, you’ll quickly feel at home because of the many friendly regulars. I love the place. Music is off the hook; The floor is a good steady floor to dance one of the few places that my knee don’t hurt the next day. The DJ has upgraded his music selection and changes old salsa to new constantly. 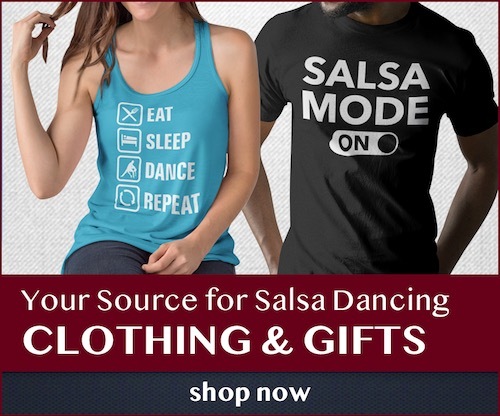 I love this because the new generation of salsa lovers don’t know the old style and I think is vital for the Salsa apprentice to know all styles. I drive 1 hr 10 min to go there every other Monday!! !